Serious and long-term worries reduce your life expectancy. American psychiatrists and molecular scientists discovered this when they studied women who cared for children. The DNA of those who cared for a chronically sick child aged quicker at cell level. The researchers took blood samples from twenty mothers with a healthy child – the control group – and from forty mothers with a seriously ill child – the experimental group. They then extracted the white blood cells from the samples. In the DNA from the white blood cells the researchers determined the length of the telomeres. The longer these are, the younger the person is in biological terms. 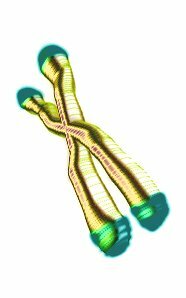 The longer telomeres are, the more often they can still divide. The more cells you have with long telomeres, the longer life your body still has in front of it. When the researchers asked the women how much stress they had in their lives, they discovered that more stress meant shorter telomeres. The figure below shows this. It seems that stress shortens life expectancy. Red = the women in the experimental group; blue = the women in the control group. The duration of stress is also a factor, the researchers discovered. The longer the women in the experimental group had been caring for a seriously ill child, the shorter their telomeres were – even when the researchers took the women's age into account. The enzyme telomerase tries to maintain the length of the telomeres in the cells. Stress reduces the concentration of this enzyme, the researchers observed when they compared women who had high stress levels with women who had little stress. Life stress is above all a mental phenomenon; it takes place in the brain. The researchers are not sure how this mental process can influence the structure of your DNA. They speculate that cortisol, the stress hormone, may have something to do with it. "Glucocorticoids increase oxidative stress damage to neurons, in part by decreasing antioxidant enzymes", is a reason given in other studies, they write. "In women, self-reported distress has been related to greater oxidative DNA damage. Oxidative stress shortens telomeres in cells cultured in vitro." It seems that a lifestyle that involves little chronic stress lengthens life expectancy. Researchers have also found longer telomeres in tea drinkers, multivitamin takers, people with high levels of vitamin D and people who exercise a lot. Proc Natl Acad Sci U S A. 2004 Dec 7; 101(49):17312-5.